Pet Head Dry Clean Spray Shampoo gets your pet fresh in a flash. 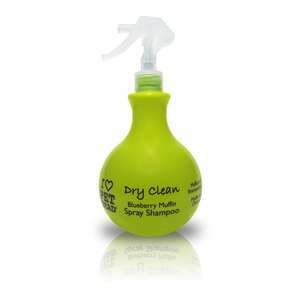 This dry clean spray on non-rinsing shampoo from Pet Head cleanses your pet's coat without water. Also perfect for trips in the car or just a quick freshen up between baths. It also has an irresistible Blueberry Muffin Fragrance. All Pet Head formulas are pH adjusted and free of Paraben, sulphate, DEA and are cruelty free. To Use: Spray liberally onto dry coat. Avoid eyes and ears. Towel or blow dry and brush out for a clean fresh coat.